People enjoy eating seafood, and eat a lot of it. The more than 6 billion people on Earth consume an average of 15.4 kilograms (almost 34 pounds) of seafood (marine and fresh-water plants and animals) each year. Seafood comes from a combination of capture fisheries (commercial, recreational, or subsistence) and aquaculture . Although the world's population continues to increase, the amount of seafood harvested worldwide has been nearly level since the early 1990s. Many fisheries have declined, and some have collapsed. Fishermen have found a few previously unexploited populations in recent years, but it is clear that the current production level from capture fisheries will not increase in the future. Increases in aquaculture production continue, but the big question is whether production will be able to keep pace with demand. Some nations impose strict regulations on their marine fisheries, whereas others do not. The challenge for fisheries scientists and managers is not only to ensure that the remaining stocks (populations) of fish do not decline from current levels, but also to adopt regulations that will lead to recovery of fisheries that already have declined. Marine fisheries are conducted in all the oceans and seas of the world, including bays and estuaries . The capture and culture of aquatic organisms in salt water accounts for the bulk of the fishery products that reach world markets. Since the early 1990s, world capture fisheries production peaked at about 100 million metric tons annually. 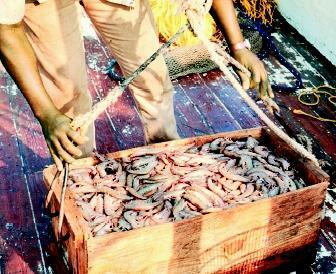 The total from capture fisheries and aquaculture was about 140 million metric tons in 2002. Slow annual increases in total production continue to occur as modest growth occurs in aquaculture worldwide. Not all the seafood that is captured or cultured in the world goes into human food. A considerable amount of it (more than 30 million metric tons in 1999) is used to produce fish meal and fish oil. Fish meal and oil are used in animals feeds, including feeds used in aquaculture. Fishes that are used to produce fish meal and fish oil include Peruvian anchoveta, Atlantic menhaden, herring, and a few other species. Seafood comes in many shapes, sizes, and categories. The majority of it is in the form of mollusks (including clams, scallops, abalone, and squid), crustaceans (such as crabs, lobsters, and shrimp), and fish. Fish are sold whole, gutted, as fillets and steaks, and as fish sticks. Subsistence fisheries are those used by local residents for survival. Some aboriginal societies also rely on fisheries for cultural preservation. 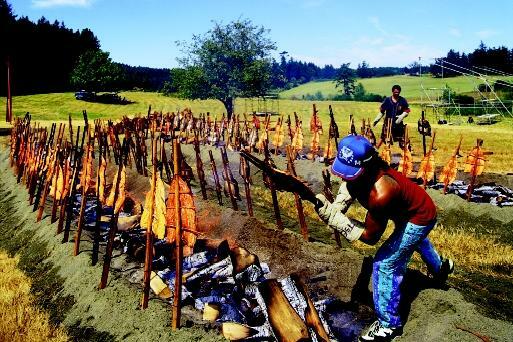 Pacific salmon, for example, are a focal point for some Native North American communities. paste called surimi. The surimi is processed into such products as artificial crab legs, imitation lobster, and similar products that mimic other seafoods. The marine animals that commercial fishers catch range from herbivores (plant-eaters) to carnivores (animal-eaters). Many are omnivores that consume both plant and animal material. The aquatic plant community makes up the base of the food chain on which the world's fisheries are based. Sunlight and nutrients such as nitrogen, phosphorus, and silicon support the growth of phytoplankton as well as larger marine plants such as seaweeds and marsh grasses. The phytoplankton community is an important food source for many other marine organisms. These very small plants, called primary producers, provide food for such animals as clams and mussels. These mollusks (and other organisms) filter phytoplankton cells from the water through their gills. Phytoplankton is the primary food of many mollusks throughout their lives. Phytoplankton also is used as food by many animals that are found drifting in the ocean. The community of those small animals, called zooplankton , includes species that remain very tiny throughout their lives, as well as the larvae of organisms that eventually grow into relatively large animals. Shrimp and fish larvae, for example, spend the early portions of their lives as members of the zooplankton community. Some animals consume zoo-plankton and in turn are consumed by even larger animals. The nearly 80 million metric tons that are harvested from the sea each year are not evenly distributed in the world's oceans. The bulk of the production is from coastal waters and waters of the continental shelves . These waters often have the high levels of the nutrients that are needed to support the marine food web described previously. The open ocean tends to be quite barren in comparison. Some of the most productive regions in terms of marine fisheries occur where nutrient-rich water is brought to the surface from great depths in a phenomenon called upwelling. One notable upwelling area occurs off the coasts of Peru and Chile in South America. Because of a combination of the prevailing current and wind, nutrient-rich deep water is pulled to the surface, where it promotes the production of high levels of plankton . That plankton community supports a large population of the Peruvian anchoveta, a small fish used in fish meal and oil production. During some years, the wind patterns change, upwelling does not occur, and the plankton community crashes. The result is failure of the anchoveta fishery. As a result, the price of fish meal on the world market increases. That can lead to increases in the prices of poultry, pork, and seafood. Periods when upwelling fails off the coast of Peru and Chile are known as El Niño years. El Niño has become a common term in recent years as a phenomenon that affects not only the west coast of South America but also the climate in much of the rest of the world. All fisheries are heavily influenced by the physical environment, but some are most strongly affected by fishery management practices. An example is the New England cod fishery. The enormous numbers of cod that existed in the North Atlantic Ocean off North America undoubtedly contributed to the settling of that continent by Europeans. For decades, many nations crossed the ocean to fish the northeastern Atlantic Ocean waters in search of cod. The fishing pressure eventually became so great that the once-huge populations of cod began to decline. Regulation of the cod fishery was undertaken by the governments of the United States and Canada, but limitations on harvest proved to be insufficient. In the 1990s, the fishery collapsed, and nearly all the fishers who depended on cod for a living were forced to find other livelihoods. With little pressure currently being exerted on the cod fishery, it may recover. However, it is possible that other species will become dominant in waters that formerly supported enormous cod populations. Only time will tell. Fishery scientists attempt to determine how many fish or shellfish of each species there are and then estimate how many of them can be harvested without leading, over the long term, to declines in the numbers of harvestable animals. One theory, called maximum sustainable yield (MSY), involves using sampling and mathematical models to determine how many fish can be harvested on an annual basis without leading to a decline. Most shrimp production is from marine waters, although there is a modest amount of fresh-water production. Each year, nearly 4 million metric tons of shrimp are harvested worldwide. given time), fecundity (number of eggs produced by the species of interest), and recruitment (percentage of the offspring that survive long enough to reach a size where they can be captured by commercial fishers). The age structure and size of the fish at any given age are also evaluated. All these factors provide information that helps scientists determine whether a given fish population is stable, increasing, or in decline. Because standing stock, recruitment success, and the other factors considered by fisheries biologists are continuously changing, and because the social and economic situation also fluctuates from year to year, the regulations also are subject to change. Regulators may limit the type and amount of fishing gear that can be used, set limits on the fishing season, mandate the total amount of fish that can be caught, or even set quotas on the number of people who are allowed to fish. Some nations have adopted a management approach known as individual transferable quotas (ITQs). As the amount of fish available for capture declines while the number of fishers stays the same or increases, the ability of each fisher to make a living is reduced. ITQs provide a means of handling that situation. Each fisher is assigned a catch quota based on the average amount of fish that person captured in the preceding few years. A person who has not been particularly successful may want to sell his or her quota to someone else, because the quota is not large enough to provide the fisher with a reasonable profit. Those who have been fairly successful will often buy up the quotas of others, thereby increasing their chances for increased profits. In some cases, governments also buy back quotas or licenses to reduce the number of people in a particular fishing fleet. The result is fewer but more successful fishers in the fishery. SEE ALSO Algal Blooms in the Ocean ; Aquaculture ; Corals and Coral Reefs ; Crustaceans ; Ecology, Marine ; El Niñ O AND La Niñ A ; Fish ; Fisheries, Marine: Management and Policy ; Food from the Sea ; Human Health and the Ocean ; Mariculture ; Plankton . Iudicello, Suzanne, Michael Weber, Robert Wieland, and Center for Marine Conservation. Fish, Markets, and Fishermen: The Economics of Overfishing. Washington, D.C.: Island Press, 1999. Johnson, Frederick G., and Robert R. Stickney, eds. Fisheries: Harvesting Life from Water. Dubuque, IA: Kendall/Hunt, 1995. Fisheries. Food and Agriculture Organization of the United Nations. <http://www.fao.org/fi/default.asp> . The United States has established a number of regional fishery councils that develop management plans for regulating the fisheries. Examples are the New England, South Atlantic, Gulf of Mexico, Pacific Northwest, and Alaskan councils. The councils depend on the opinions of fishers, the public, and fishery scientists to determine the quota, or how many fish of each species commercial fishers should be allowed to catch each year. Yet quotas are not always based on what is best for the fishery. Maintaining support for the livelihood of commercial fishers often is given a high level of consideration. The dominance of management decisions based on social and economic priorities over scientific evidence of a declining fishery played a large role in the collapse of the cod fishery.